I have saved my very first Diamond Pickaxe ever since I had first gotten it. Its name was Roxanne. My friend, ABYSSALxPro, also has saved his first DPA, and named his. What have you named your first Diamond Pick, and have you guys saved yours as well? Ah, my first DPA. Her name was Ol' Faithful. Never even let anyone barrow it. I have it on an old world. Really love this idea. Mine was named "Damn This Mines Fast"
Mine was from an old 1.8 world. I used it to gather some obsidian, and made a nether portal with it. I put it in a chest, and the world was corrupted when I tried force quitting to undo creeper damage. I still have the world, but the level seed is gone forever, so I'll only get corrupted and bad chunks when exploring. John Henry. It's a song about his hammer, but what the heck...I figured I'd name the Ax. I have it in a saved in a bedroom chest in a single player that I haven't touched since 1.8. Just been multiplayer since then. Currently I'm just working on enchanting a diamond suit for The End visit coming soon. I guess I strip mine a lot more than most? Either way, I don't find it very rare at all. Emerald either for that matter. I do drag around an enchanted diamond pickax with Fortune III/Unbreaking III/Efficiency IV, so that helps with the drops quite a bit. I've never even thought about naming any of my tools. I named my first pick "Sir Fortunalot the Third". Never even let anyone barrow it. I named mine Diggy. I have plans for my first sword's naming to be Sir Stabalot :D.
"Diamond Pickaxe~". I name all them all just to make it cheaper to repair. I have a texture pack that replaces chicken for KFC. My friend and I play with it both. We play on my server, and we call it KFC instead of chicken. So I renamed a piece of chicken KFC, then my diamon sword "KFC Killing Machine" and my diamon pickaxe "KFC Mining Tool"
I must confess I really don't understand why people would use up precious diamonds on tools like picks and shovels, but maybe I'm just a scrooge who hoards my resources too much, idk. I literally have more diamonds than gold. Mostly because I use up all my gold on Super Apples. Note that these are diamonds I have left. 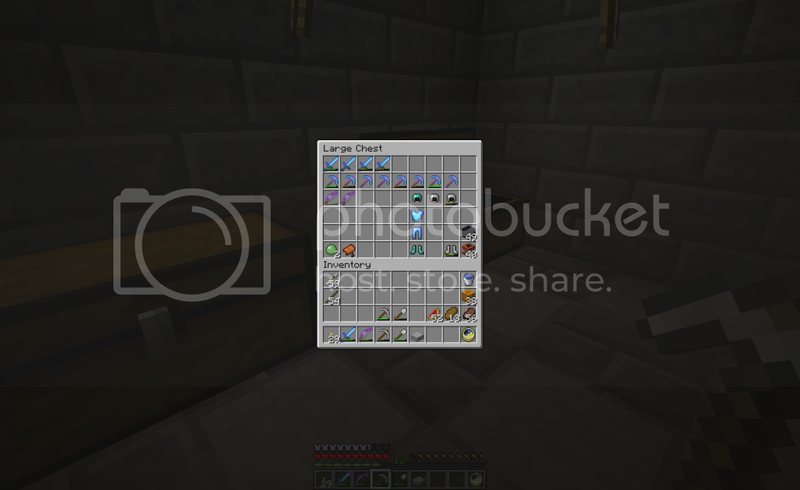 I also have loads of already created diamond armour; a good 15-30 pieces of each tool and armour, etc. (well except a Diamond Hoe, I only have one of those). The main reason I use diamond is because I prefer to work with enchantments. 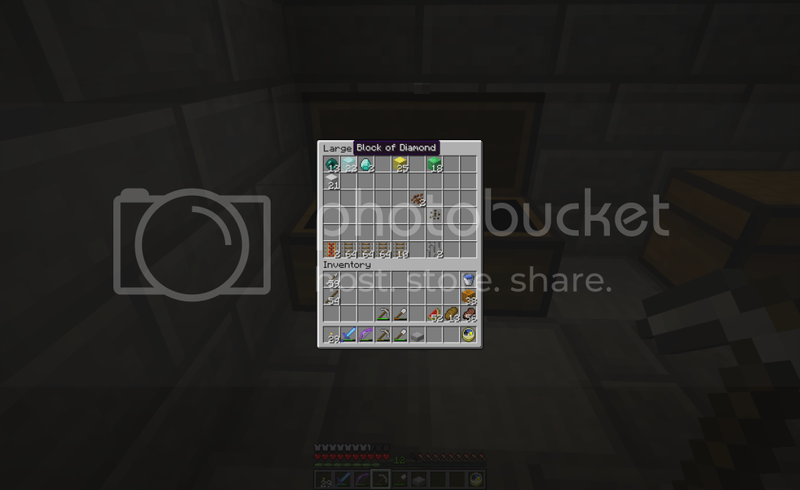 And the enchantments will last longest on diamond. As to the topic, I didn't give my first diamond pickaxe a name. I don't think I even have the first world in which I crafted one anymore. I named my enchanted diamond sword the Ban Hammer... OK, so it isn't a hammer, but whatever. Don't think I've ever named a pick... though I do have one with tons of enchantments that I use on special things (silk touch mainly), and a bow with infinity, power, and fire. Haven't named those. I named my diamond pickaxe The Miner! on my server. But it definitely wasn't my first, since I've been playing this game since Beta (technically, since Alpha, since I shared my brother's account for a while). It wasn't even the first one I had on that map. It was just the first one I got on that map that had the enchantment I wanted. 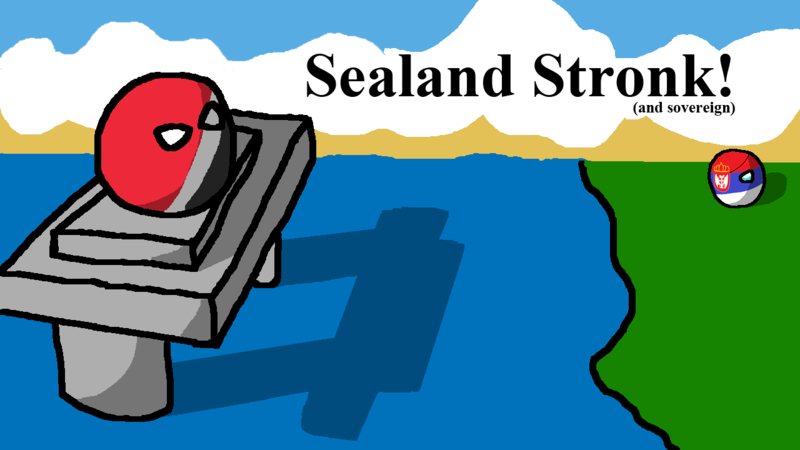 And then since we have a really good experience grinder on the map, I figured, what the heck, I'll name it. I'd say gold is probably the hardest resource to build up a quantity of. You can always use fortune picks on diamonds. 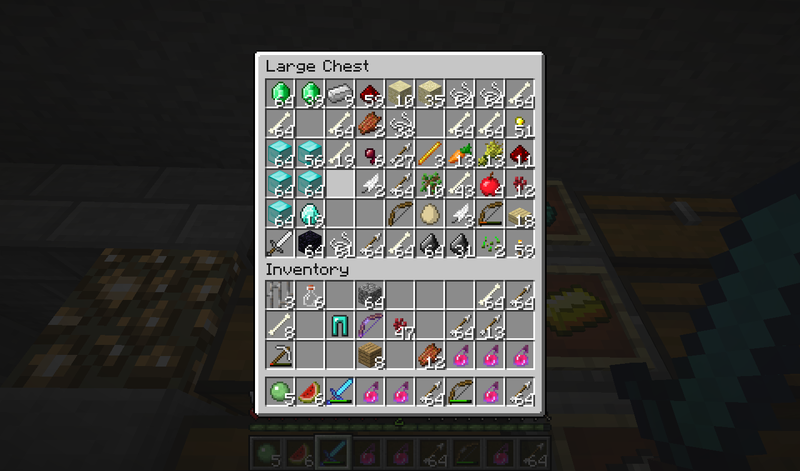 To be honest, I'll usually just make a note of where I found diamonds and leave the behind until I have a fortune III pick (okay, so obviously I still have to mine the first 5 diamond without it to get the resources needed, but that's beside the point). My first DPA was named Old Reliable. I had that pick for a long long time. I shall never forget him.